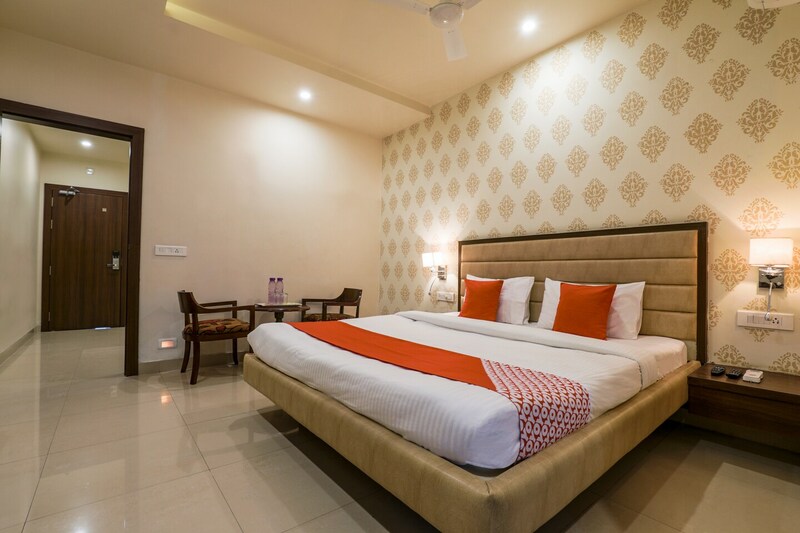 SPG Grand is a trendy and fashionable property with large cosy rooms and located on Champapet Road in Kharmanghat, Hyderabad. It is close to Pavan Puri Colony Bus Stop, Green Park Colony Bus Stop and not far from Yakutpura MMTS Railway Station. Places like Priyadarshini Park and Green Park Colony are close by. The property has a large and lavish banquet hall with stylish false ceiling and trendy lighting. There is a conference room for business guests as well. The lobby and hallways are well-lit and tastefully decorated with tall vases. The rooms are spacious, furnished aesthetically and have beautiful wallpapers. Each room in this property comes with AC, TV, and the elegantly tiled bathrooms are fitted with geysers. The other advantages are free Wi-Fi, elevator, CCTV security, power backup, card payment facility and laundry services. N Village, Delicious Dosa, Karachi Bakery, Papadams Blue and Lucky Restaurant are the eateries in the vicinity.